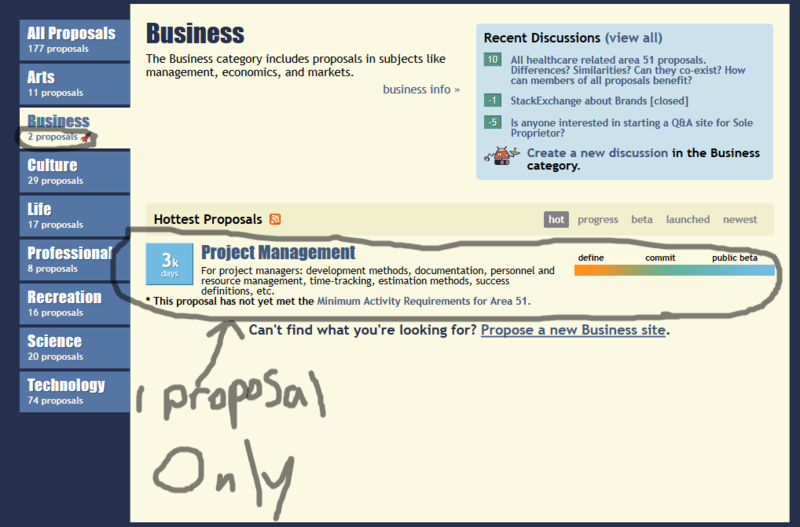 On the menu bar, the Business category has 2 proposals, but in the list it only has one. Is this a bug or is one proposal deleted? Each tab only shows the proposals that belong under that sort (hot proposals, beta sites, launched sites, etc). If you take a look at the Professional category (for example), you'll noticed that every proposal does not show up under every tab. So in the business category with 2 proposals, you’re seeing one in the ‘hot’ tab; the second proposal is under ‘launched’. It's not a terribly effective way to present that information (and not likely to be fixed as a [bug] at this point), but that IS working as designed. Not the answer you're looking for? Browse other questions tagged business status-bydesign bug . Why is Gavin listed twice on the “Top Beta Users” list?